Plan the perfect sports viewing party with Zenkit! Even if you’re not that into football, there’s something about the World Cup that brings people together. Whether it’s the love of the game, a sense of patriotism, or because party food is your gig, being at a World Cup party with friends and family is really one of the best things about football’s ultimate tournament. 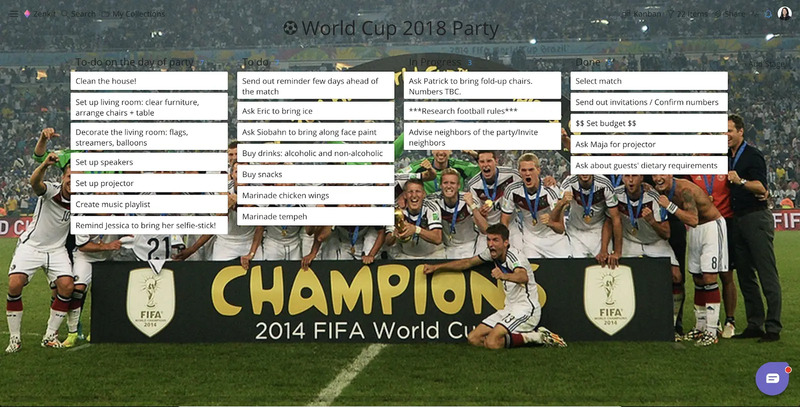 In this article, we’ll show you how you can become the man of the match by hosting the perfect World Cup party using Zenkit. 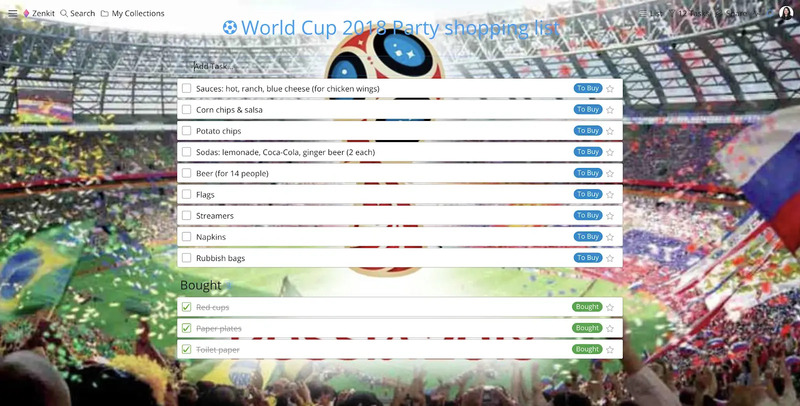 Planning a World Cup party is a project of its own, which is why using a project management tool makes sense. There are resources to organize, a budget to adhere to, and a deadline to work against — not to mention people to satisfy. First thing’s first, you have to decide what kind of party you are hosting. Setting a budget will help with your decision as it will determine the course of everything else: what you can buy, who to invite, food to serve, and so on. Do you have enough space/furniture to accommodate all your guests comfortably throughout the entire game? World Cup matches can get a bit heated, so if the viewing is at night, will your neighbors be OK with the noise? Do you have enough cleaning supplies to take care of everything once the party is over? Once you confirm all this information, you’ll need a place to store it all. Zenkit’s Kanban view is the perfect feature for this. Its visualization of a workflow is ideal for coordinating any type of project as it allows you to follow progress and see what needs to be done next at a glance. It can also help with determining the priority of tasks and deadlines, and makes editing and re-organizing a breeze. 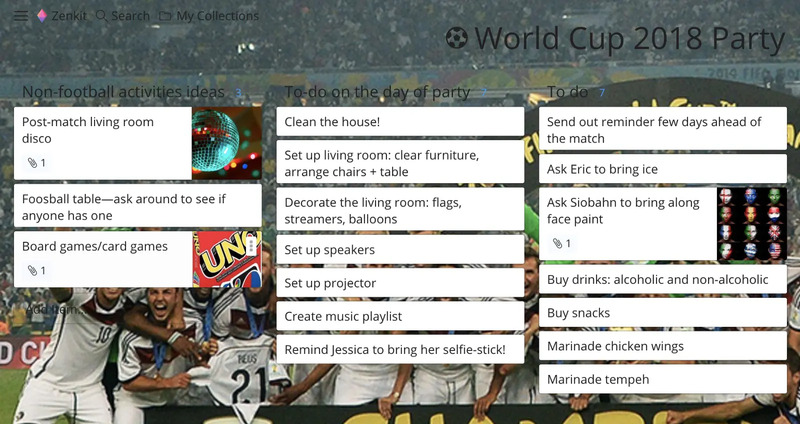 To make your World Cup party schedule, simply create a new collection and open the Kanban view. Create the lists or columns and name them whatever you’d like. We’ve gone for ‘To do on the day of the party’, ‘To do’, ‘In Progress’, and ‘Done.’ Then start listing your tasks and move them along the various stages as you progress. Full Kanban instructions can be found here. Your next priority is to choose which match to watch. Keep in mind that this is what your whole party will be based on, so it’s a crucial decision. The obvious route is to select a match that your country is playing in, however, for those football enthusiasts who’s countries did not qualify, going with either the final or semi-finals is always a safe bet. Bear in mind the time differences of the match viewings, no one wants to attend a party at dawn. 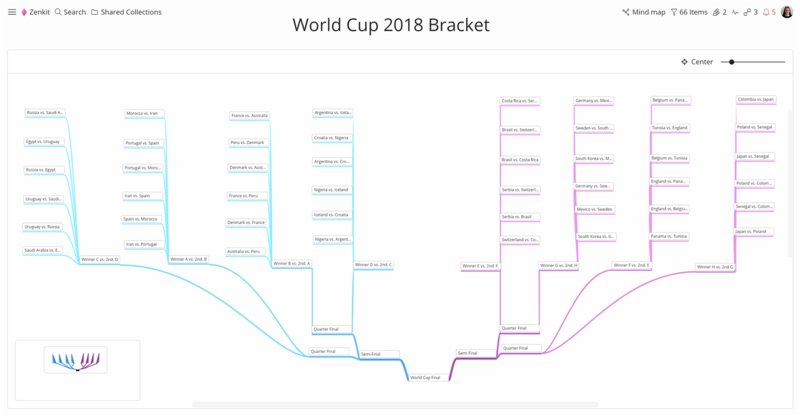 Use Zenkit’s bracket template to help with your decision. With team information and match times on display, it’s a handy tool for following the entire tournament. You can’t have a party without guests! Organize and confirm your invitation list as early as possible as that will not only give your guests enough notice, but it will also you give you enough time to start making arrangements for the party. 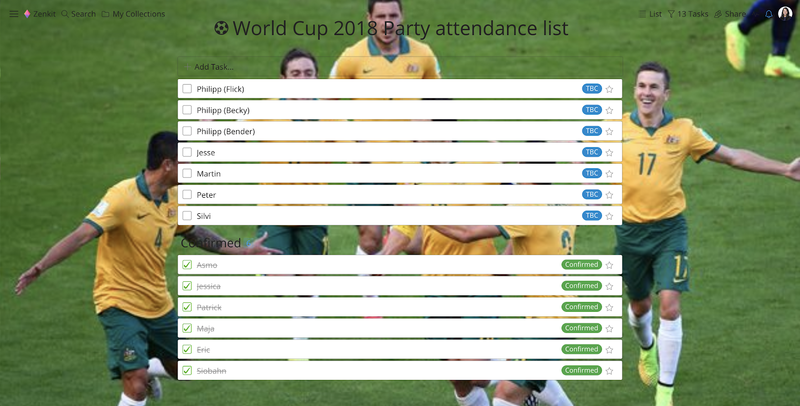 To keep track of it all, create an attendance list using Zenkit’s list view. A good tip is to change the label options from the default ‘To-do/Done’ to ‘TBC/Confirmed’ (or whatever else you’d like). To do this, click the Stage Properties, then rename of your choice, and then hit save. Full list instructions can be found here. When it comes to hosting a party, it’s essential to have food and drinks. Decide the level of involvement you’d like your guests to have, whether you want it to be potluck style where everyone brings something, or if you’d rather be the hostess with the mostest and provide it all yourself. Your budget and guests’ dietary requirements will help determine what kind of refreshments you can serve. 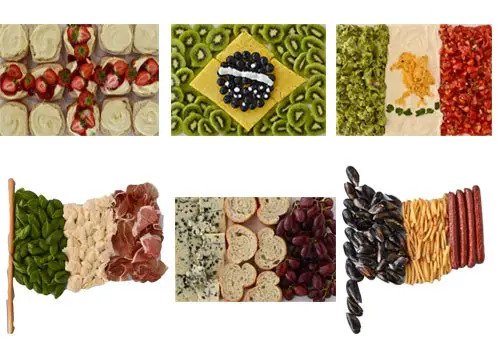 If you’re feeling creative you can theme the food based on the different nations participating in the tournament. If not, then things like pizzas, chicken wings, chips and dips are always a party favorite as they don’t require so much cutlery. Remember that running out of refreshments is a social faux pas, so make sure you’ve bought enough to cover everyone attending and then some. Use the list view feature to create and keep track of your shopping list. It’s a World Cup party so decorations are a must. 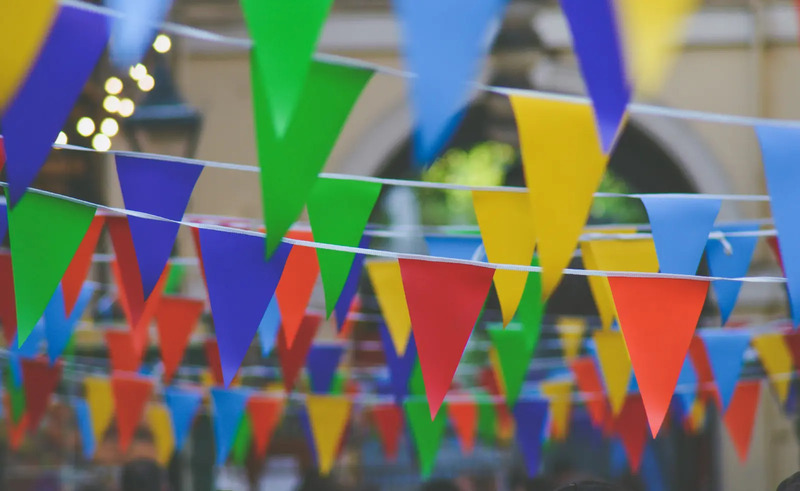 Set aside some of your budget to cover flags, balloons, streamers, and whatever else you think will create a great atmosphere. Another way to get people into the spirit is to encourage your guests to wear country colors. Face paint at the ready is also always a good idea. Although it is a World Cup viewing party, it’s always thoughtful to accommodate to the non-football enthusiasts too. Have some board games or a deck of cards on hand in case people start to tire of the game. To keep celebrations going, or to liven the mood in case of a frustrating result, organize a post-match activity that everyone will enjoy. 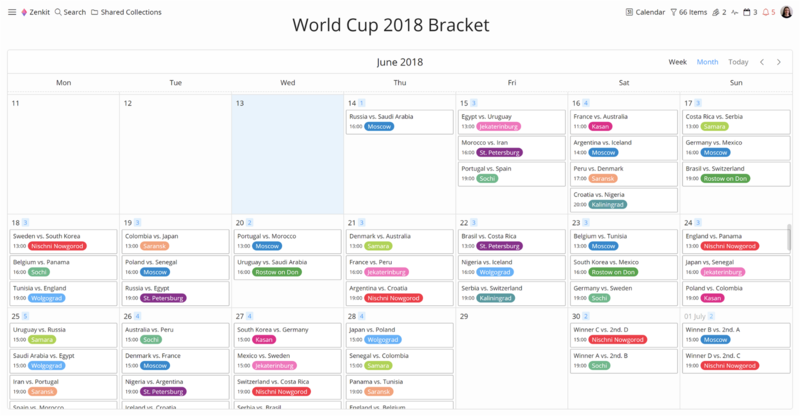 Zenkit is designed to streamline any project or task management experience and events, including a World Cup viewing party, are no exception! With visual tools and templates to aid your planning, your party is sure to score a massive win (even if your team isn’t).